July 6, 2018 | Advertising Disclosure | Our Sponsors may be mentioned in this article. Nashville is one of the top destinations for the 4th of July. From the fireworks show to rooftop parties to incredible live music, it’s hard to beat the fun in Music City on Independence Day. Whether you’re visiting from out of town or a local wanting to partake in the festivities, Nashville Guru has you covered. Here’s a round-up of the top Nashville 4th of July celebrations in 2018. More events will be added as they are announced, so bookmark this page! Coming in from out of town or need a staycation? Check out the Where to Stay in Nashville Guide and The Best Hotels in Nashville Guide for top recommendations. Music City celebrates July 4th in downtown Nashville with live music and a huge fireworks show. Join in on the fun on Wednesday, July 4, 2018, with FREE concerts at 5th and Broadway and the Nashville Symphony performing at Ascend Amphitheater during the fireworks show. The site opens at noon. 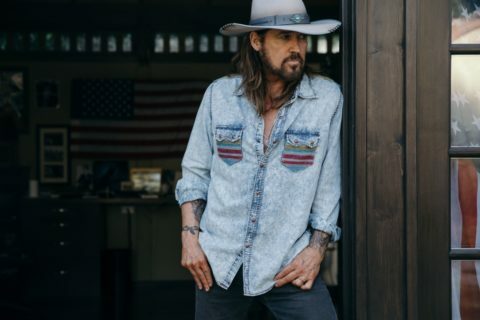 A DJ will entertain from noon until 4:00pm followed by live performances by Lady Antebellum, Chris Janson, Lucie Silvas, and Shannon Sanders. There will also be kid-friendly activities and vendors during this free event. If you’re looking for somewhere to eat before heading to the heart of downtown, all of these restaurants are walkable or a short ride to downtown Nashville: Etch, The George Jones, Saint Anejo, The Southern, Whiskey Kitchen, Chauhan, Moto, and Pinewood Social. 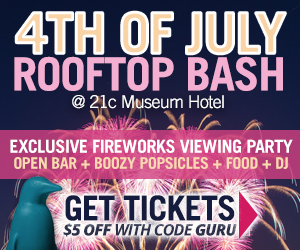 Want to watch the fireworks from a rooftop bar? Several rooftop parties are listed below. Rooftop parties will be added as they are announced. For more rooftop options, see the Best Rooftop Bars Guide. 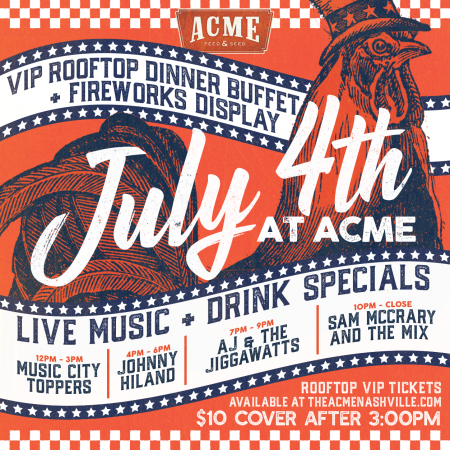 Acme Feed & Seed on Lower Broadway is throwing an all-day celebration on Wednesday, July 4, 2018. There will be live music from Music City Toppers, Johnny Hiland, AJ & The Jiggawatts, and Sam McCrary and The Mix. Cover is $10 at the door after 3:00pm, granting access to floors one, two, and three. VIP Rooftop access from 3:00pm to close is $150 per person and includes views of the fireworks, a dinner buffet from 5:00pm to 7:00pm, and party favors. VIP booths are also available. 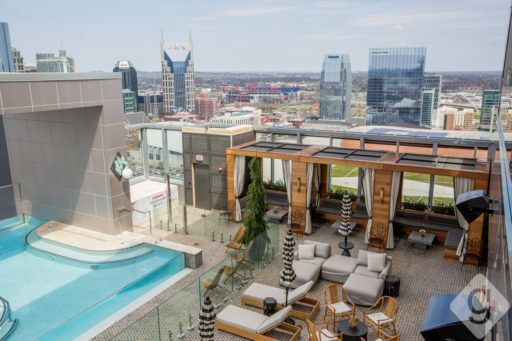 Nashville’s highest rooftop bar, L27 Rooftop Lounge, is hosting Red, White, & BBQ on Wednesday, July 4, 2018, from 6:00pm to midnight. The celebration will feature BBQ, festive cocktails, music, and beautiful views of Nashville. Tickets are $75 each. 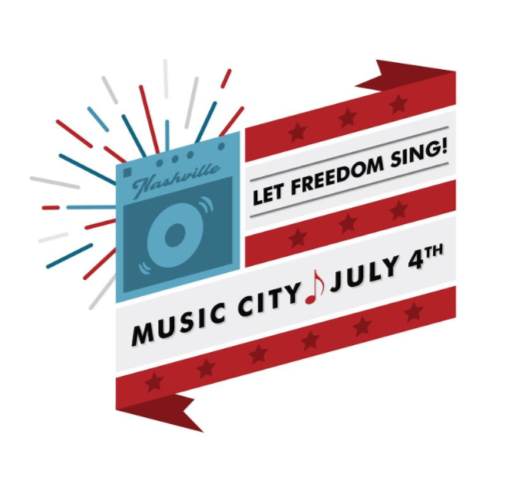 Rare Bird atop the Noelle hotel in downtown Nashville is hosting an Independence Day party on Wednesday, July 4, 2018, from 7:00pm to 9:30pm. Tickets are $200 per person and include exclusive entry to Rare Bird, an open bar (draft cocktails, wine, and beer), food stations, passed appetizers, music by DJ Foldy, and premium fireworks viewing from 13 flights up. Taxes and gratuity are also included in the price. All ages are welcome, but you must be 21 or over to consume alcohol. The event is rain or shine. The George Jones 4th of July Celebration on Wednesday, July 4, 2018, kicks off at 5:00pm and will feature adult slushies, Smokehouse BBQ, live music all day on all levels, and incredible views of the fireworks for VIP guests. The main floor is open to the public, free, and all ages. VIP tables are available on the main floor ranging from $300 to $800 depending on party size. Rooftop access tickets are $50 per person (no access to railing) and VIP rooftop railing seating is $200 per person. Additional VIP seating options are also available. Make your way up to 21c Museum Hotel Nashville’s rooftop for a super exclusive fireworks viewing party on Wednesday, July 4, 2018, from 7:00pm to midnight. Tickets are $200 per person and include a full open bar, boozy popsicles, and food from Gray & Dudley. Space is extremely limited. This event is 21 and over. Save $5 with promo code GURU. 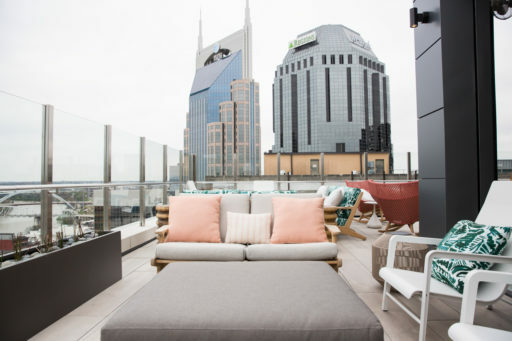 Up, a rooftop lounge is hosting a 4th of July celebration from 5:00pm to 1:00am on Wednesday, July 4, 2018, with exclusive views of Nashville’s fireworks. The event will feature live music, a DJ, dancing, a gourmet dinner buffet, raffle giveaways, a photo booth, valet parking, and drink specials. Tickets are $125 each and are required to attend. This is a 21 and over event. 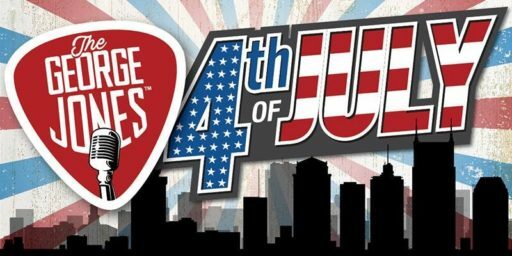 Nashville Underground’s 4th of July Party will offer great views of the downtown fireworks on Wednesday, July 4, 2018. The rooftop party is $150 per person and includes a buffet from 5:00pm to 9:00pm, DJ, assorted desserts, and bar snacks. VIP booths for up to 12 people are $1,800. Attendees must be 21 or over to enter. There will not be in-and-out privileges. Bobby Hotel’s July 4th Rooftop Party is Wednesday, July 4, 2018, from 8:00pm to 10:00pm at the Rooftop Lounge. Tickets are $150 per person and include three wine or beer drinks, carnival fare, DJ, and front row viewing of the fireworks from the 10th floor. The event is 21 and over. Ole Red, Blake Shelton’s brand new bar on Lower Broadway, is hosting an exclusive party on the rooftop on Wednesday, July 4, 2018, starting at 5:00pm. Tickets are $150 plus fees and include VIP access to the Lookout at Ole Red from 5:00pm to 11:00pm, passed hors d’oeuvres from 5:00pm to 7:00pm, a signature cocktail at the start of the fireworks, and entertainment. Additional food and drinks will be available for purchase. This is a 21 and over event. Pinewood Social is hosting A Pinewood Independence Party on Wednesday, July 4, 2018, from 6:00pm to 10:30pm. Tickets are $100 and include exclusive access to the Pinewood patio, unlimited cookout fare, and two boozy beverages. Attendees can watch the fireworks, cool off in the dipping pools, play bocce ball or ping pong, and enjoy hot dogs, hamburgers, chips, tater tots, and more. Additional beverages will be available for purchase. This is a 21 and over event, rain or shine. Celebrate Independence Day on July 4, 2018, starting at noon on Broadway’s highest rooftop at Dierks Bentley’s Whiskey Row. The Whiskey Rooftop will keep the party going all afternoon with a live DJ, drink specials, and more. Attendees will also have one of the best views in downtown for the Let Freedom Sing! Music City July 4th fireworks show beginning at 9:30pm. The event is first come, first served, so make sure to get there early! Admission is free. Make your way to L.A. Jackson’s rooftop on Wednesday, July 4, 2018, for a celebration from 3:00pm to late night. DJ Case Bloom will be spinning tunes from 7:00pm to midnight. The L.A. Jackson team has crafted a patriotic menu of beer brats, ice cream sandwiches, and red, white, and blue cocktails. Admission is free. Get there early—It’s open seating! The four-story Mellow Mushroom on Lower Broadway is hosting Red, White, & Booze 4th of July Rooftop Party on Wednesday, July 4, 2018. Only 100 tickets are available, which are $50 in advance and $75 at the door. Private party options of 20 people or less are also available for purchase. Contact Tammy at tammyl.mellow@gmail.com for private party availability. This event is 21 and over only. Famous Saloon is hosting a 4th of July Rooftop Party from 5:00pm to 1:00am on Wednesday, July 4, 2018. The Rooftop VIP party is $100 per person and includes views of the downtown fireworks, a DJ after the fireworks, and a Famous Saloon gift bag with merchandise. Admissions is free to the Main Floor and River Room. This event is 21 and over. See the Nashville fireworks from one of downtown’s best rooftops at Rock Bottom Brewery on Wednesday, July 4, 2018. Rock Bottom will be open for lunch starting at 11:00am and will reopen at 5:00pm for the rooftop party. A DJ will perform starting at 9:00pm. Cover is $20 at the door. 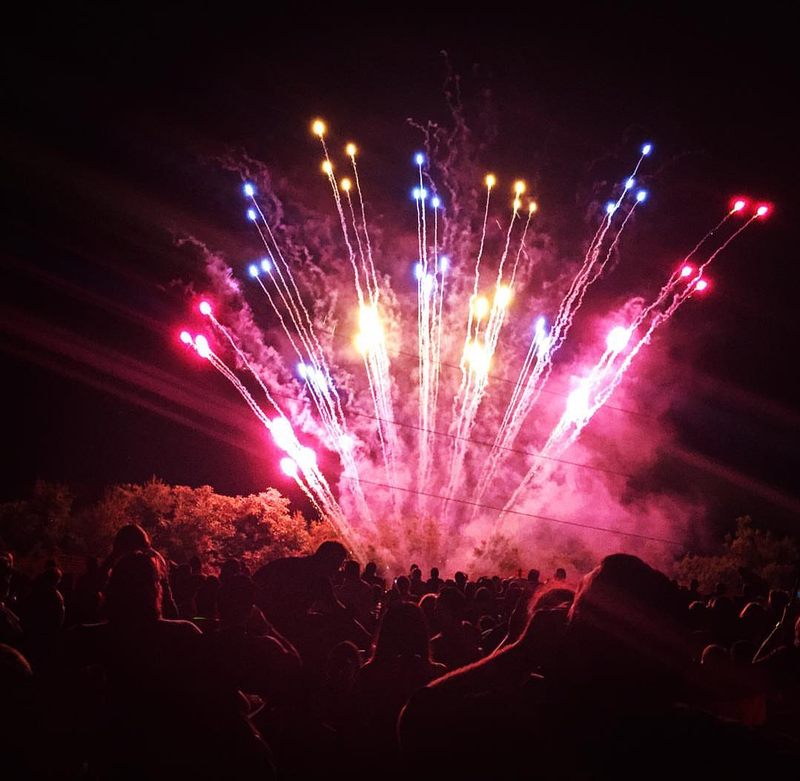 Geist in Germantown is hosting a Fourth of July Fireworks Viewing Party on Wednesday, July 4, 2018, starting at 5:00pm. The event will take place in their Champagne Garden, offering views of the official Nashville fireworks show. Tickets are $25 and include food and beverages. Space is limited. For daytime fun on Wednesday, July 4, 2018, visit Nelson’s Green Brier Distillery from 11:00am to 4:00pm for free tours, tastings, food, games, and live music. Charles Nelson, the inspiration behind the revitalized distillery, was born on July 4th, so what better time to celebrate? All ages are welcome. The 12th annual Music City Hot Chicken Festival is Wednesday, July 4, 2018, from 11:00am to 3:00pm at East Park. This East side tradition includes the best hot chicken in town, cold beer, and other vendors. Live music will be going on all day. This event is free and family-friendly. Kick off your July 4th with a four-mile run or walk through downtown Nashville on Wednesday, July 4, 2018. This race will start at 8:00am at E.S. Rose Park in Edgehill Village. Registration is $25 to $50 depending on when you register. Celebrate Independence Day early at TailGate Brewery on Tuesday, July 3, 2018, from 11:00am to midnight with live music, craft beer, cider, wine, liquor, pizza, and a professional fireworks display at 9:00pm. This is a family-friendly event. Admission is free. Limited parking is available for $10, so ride-sharing is recommended. Thirth of July in East Nashville is an annual tradition on July 3rd. Each year, people join at North 12th Street between Ordway Place and Calvin Avenue for a huge block party with great live music, food, and drinks. Check back here for 2018 information. Get home safely — Here’s some FREE ride credit for new Lyft riders.